Book a Philippines cruise. Small ship cruises from Philippine Trails. The Palawan Discovery - a boutique Cruise Ship cruising the Philippines. Between August and November, hire a whole ship for a 7 day Cruise, starting and ending in Cebu. Groups of up to 16 persons. 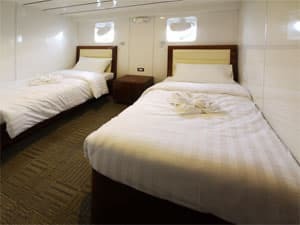 (8 cabins, 2 berths in each). Contact Us for Availability and Cost. See our Liveaboard Diving Page. 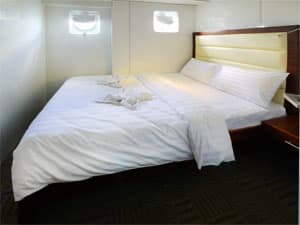 The Palawan Discovery is a boutique cruise ship that has been completely refurbished, and is now offering a number of fabulous cruises, mainly between the months of October and March. Spaces are limited and fill up fast so be sure to reserve your cruise at the earliest opportunity! Built in Holland, the ship was a originally three-masted schooner that cruised the Caribbean. In 2006 she was refitted with a more powerful engine, plus modern navigational equipment. She was moved to the Philippines and in 2013, she underwent a USD 1.5 million renovation and was given her new name, "Discovery Palawan". N.B. If your visit to the Philippines is for a longer duration, let us know, and we'll tailor the overall itinerary to suit. Just let us know where else you wish to visit, or let us suggest! Divers and Non-Divers Catered For! The cruises are unique as the itineraries are designed for those who wish to cruise only, as well as for divers and snorkelers! • A 7 Day Cruise from Cebu in the central region of the Philippines. • An 8 Day Cruise from Batangas visiting Coron and Apo Island. If your visit to the Philippines is for a longer duration, let us know, and we'll tailor the overall itinerary to suit. Just let us know where else you wish to visit, or let us suggest! Children are defined as anyone under the age of 12 on the start of the date of the trip. When children are on board, they must be accompanied by at least one parent or legal guardian at all times. Discovery Fleet Corporation accepts no responsibility for the care of the child and does not provide baby care or nanny facilities. Children up to 5 years of age are free as long as they share the parents bed/room. Children 5 years and one day up to one day short of 12 years pay 60% of the trip fee. *All passengers, regardless of age must pay park fees.